SI Restoration is cleaning up water, fire, and mold emergencies for commercial properties in Baltimore. No matter what kind of emergency it is, building owners have to act fast to remediate the damage. Baltimore's office buildings and multi-story high rises are extremely vulnerable to large loss emergencies. 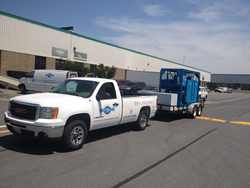 SI Restoration is cleaning up water, fire, and mold emergencies for commercial properties in Baltimore. Baltimore has a lot of office buildings and multi-story high rises that are extremely vulnerable to these kinds of large loss emergencies. Water damage is the most immediate concern because it can stem from so many causes. All it takes is one burst pipe or one faulty sprinkler and entire floors can be flooded. With water damage, everything must be extracted and removed, and it can mess up not just the building, but also the belongings inside of it. Fire damage is the next biggest concern for commercial buildings because of how easily it spreads. Fires can quickly go from one floor, to multiple floors, to being a total loss situation. After fires have been put out, property managers will have to deal not only with fire damage, but also with smoke, soot, and water damage as well. Although mold isn’t as immediate of a danger as water or fire, it’s still a serious concern for business owners and landlords. Mold severely damages a building’s air quality and has the potential to cause serious illness. If the infestation is large enough, it can shut down work in the building for extended periods of time until the mold is removed and damage is repaired. Whether it’s a water, fire, or mold emergency, building owners have to act fast to remediate the damage. With water emergencies, the process has to be started within 48 hours to reduce the risk of permanent losses, and mold and fire situations should also be taken care of immediately to prevent further damage. The main thing for business owners in these situations, is to find a company that can handle large losses. Commercial property cleanup is a lot different than residential cleanup, as it requires different equipment and training. SI Restoration is prepared for exactly these kinds of large loss situations and offers 24/7 emergency services. The in-house staff is certified with the Inspection Cleaning and Restoration Certification (IICRC) for water, fire, and mold damage and comes with the necessary training and insurance. Having a business suffer any of these kinds of damages can mean a lot of wasted money, time, and stress for the owners. It’s important to get the situation resolved immediately, so businesses can go back to functioning as usual.